When I was in high school, I went on a camping trip with a couple of friends and one of their dads in the Boundary Waters Canoe Area of northern Minnesota. One night, I went out by myself with my sleeping bag. I lay down on a rock surrounded by water and discovered a new kind of peace. Everything was so quiet, but so alive: the waves lapping all around me, the moonlight flickering on the waves. I started to feel as if I were touching the edge of some hidden kind of experience. I fantasized about returning someday for a solo trip; given enough time alone, I thought, I might find something special, some key to life. 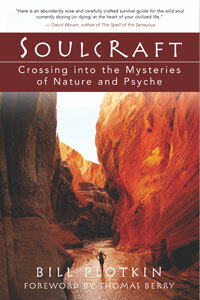 So imagine my thrill of recognition when I discovered New World Library’s book Soulcraft by Bill Plotkin. Plotkin is a depth psychologist and wilderness guide who leads programs in nature where people explore their deepest selves. Here was an intelligent, articulate, accomplished person who recognized that inner call I’d heard. 1. It offers remarkable guidance from a remarkable life. Bill has lived intimately with the wildest parts of both the human psyche and North America. He has led thousands through all the stages of Joseph Campbell’s hero’s journey: from leaving home to encountering soul to cultivating a soulful relationship to life. The stories of his experiences are remarkable, and he also tells of the transformations of his clients and fellow seekers. 2. It gives you compelling “next steps” in life. What happens after graduation, finding a job, finding friends and love, getting married? Or what happens when you’ve given up hope about the deeper meaning of any of those things? 3. Its nature-inspired tools will help you “dance in the dark.” Whether you’re working with your dreams, your shadow, or your darkest inner places, he can inspire you — and, even more important, give you specific things to try. Even though I have yet to realize my younger self’s dream of solo wilderness exploration, Soulcraft helped bring the spirit of wildness into my life. After all, you don’t have to go to the Boundary Waters or the Badlands to find soul: there are a lot of wild places hidden in plain sight. Assistant editor and submissions editor Jonathan Wichmann has been with New World Library for nearly eight years.